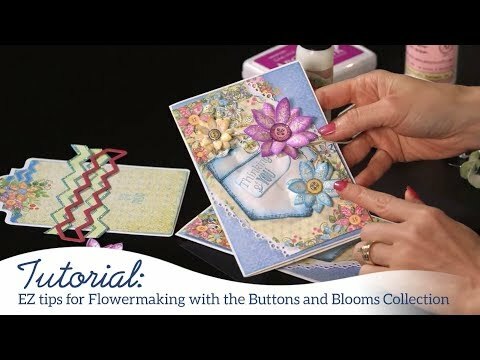 Instructions: Using your Buttons and Blooms stamp, stamp the medium size flower in teal zeal, the small size in morocco ink and lightly shade with the matching color and die cut with coordinating die. Shape with your deluxe flower shaping kit. Using your leafy accents stamp, stamp your flourish leaves using Versafine Olympia Green and color with peeled paint ink. Die cut with coordinating dies and shape in the 3D shaping mold. Using your Buttons and Blooms Paper Pad cut the inside mat 5 3/4" x 6" wide, you want to cut the panel so the flower is in the bottom right corner. Cut your front pocket panel 5 3/4" x 3 9/16" wide. Cut the stitched strip with the 3 buttons 5 3/4" long so the buttons end up on the right side. Cut your white card base 12" x 5 3/4", fold in half and use a bone folder for a cleaner line. Adhere your pocket mat to the left side of the front panel and then trim off the excess white card. Adhere your insert mat so the flowers are in the bottom right and the strip is running vertically. Using 3D tape, adhere your button strip over the top of the printed bottom strip. Adhere your leaves and flowers. Using 3d adhesive adhere your "Have a Wonderful Birthday" sentiment so it hangs over the opening of the card. Tie a twine bow and adhere at the top of the sentiment.